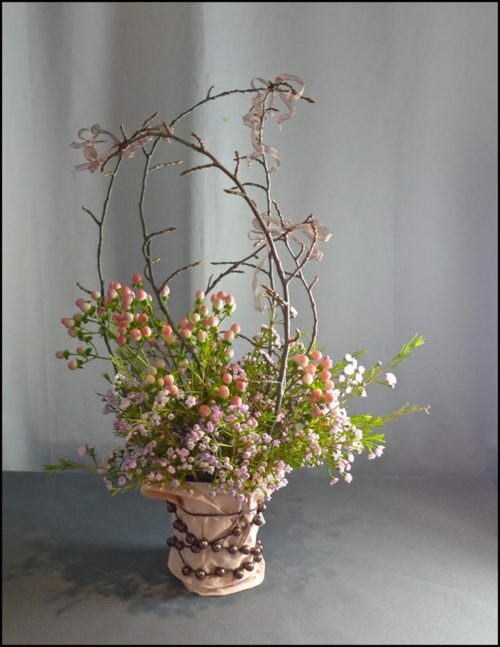 Romantic winter flower arrangement made from berries, wax flowers and naked twigs. It’s been a year since I last updated my blog. So I start with a retrospective of the works I did about a year ago when the fall was turning in to winter just like now. Looking at the picture above I was feeling somewhat romantic at late fall with the pink and light rosy shades. I’ve been very anti floral foam, but last fall I did try using floral foam. Well, it’s easy to use and also makes the arrangements transportable and therefore more commercial, in case one would like to monetize one’s floral art. And a year ago I had the idea of trying to turn my hobby into a business. Didn’t succeed, but that’s a different story. The arrangement above is made into an empty plastic jam container wrapped in a piece of a paper tablecloth. Why not use empty food packages, you can always upcycle them. The pearls and ribbon are from a door curtain I bought from a flea market. Naked branches collected by the roadside and fresh material from florists shop. I just love waxflowers, and their season is fall and winter time. Unfortunately, I don’t know the name of those berry branches, but again they are a very common item at florist’s shops during the fall and winter season. I did deliver this to a friend of mine, and the arrangement did hold the car ride undamaged, so I see why using floral foam is mainstream. Oh yes, I was very much into threaded rod, so of course, I had to make a version with a threaded rod as well. I used rest flowers, and there seem to be some carnations too. This time the wrapping paper is grey to match with the grey wool and metal. Finland as an independent country turned 100 years old on 6th of December 2017. Inspired by the occasion I made this arrangement. Blue and white represent the flag of Finland. Thanks to nationalist movements, I must say, all kinds of national symbols make me kind of scared. But at the time I got an assignment from my ikebana sensei, who told me to do a festive arrangement and independence day just happened to be the closest festive day. 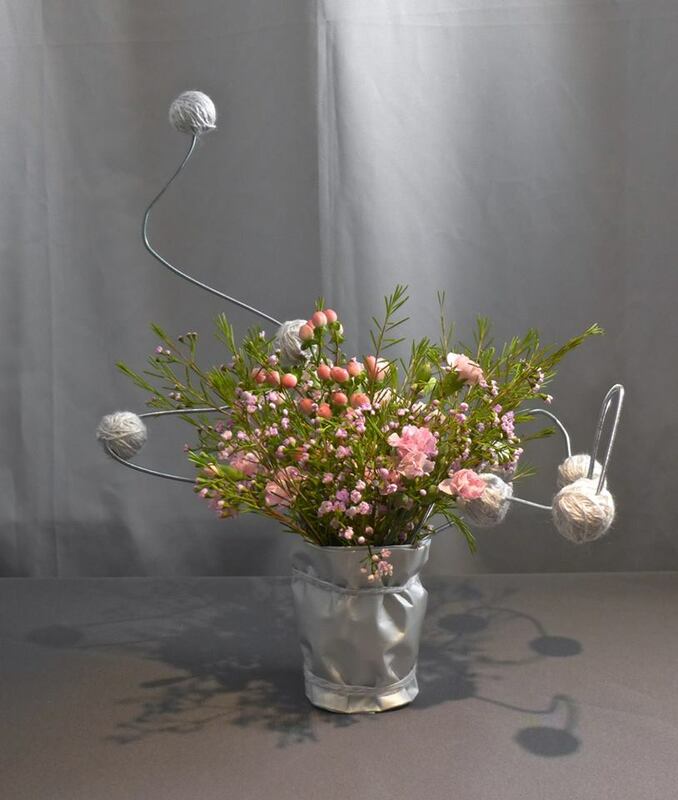 The pine branches represent Finnish nature and the gray wool around the vase is like villasukka, a hand knitted wool sock, an essential item in everyone’s winter garderobe. And by the way, this arrangement has a name. It’s called The Land of a Thousand Sad Songs. Now, if this isn’t wintery, I don’t know what is. Wool is cool, isn’t it? It’s the same vase as in the previous picture, covered with grey wool. 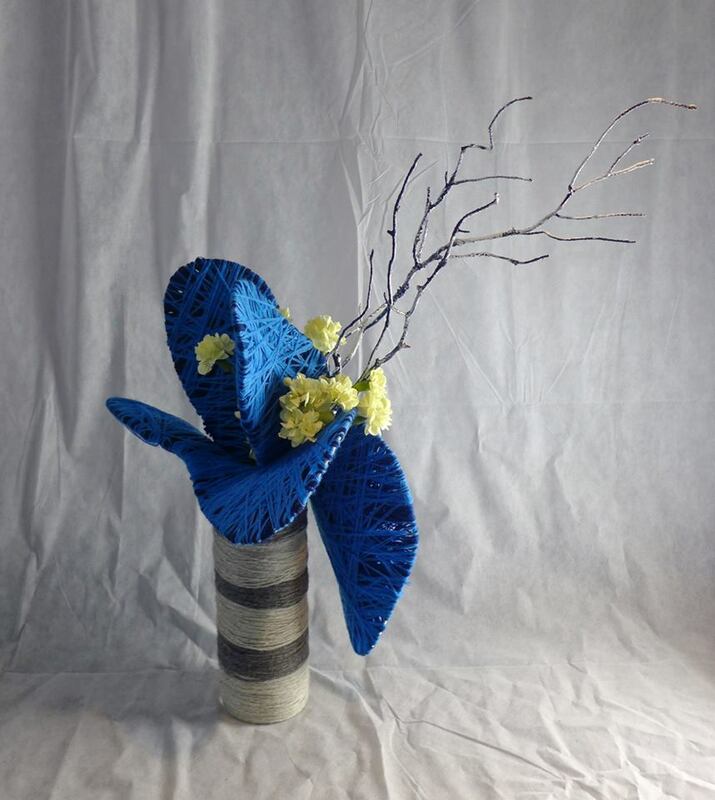 Those sculptural blue elements are made of threaded rod and wool. I just formed loops with threaded rod and covered them with wool. The wool is from a nearby thrift shop and didn’t cost practically anything. I just added a couple of supermarket carnations and some self-painted twigs. Now the question is, can I really call this a flower arrangement? 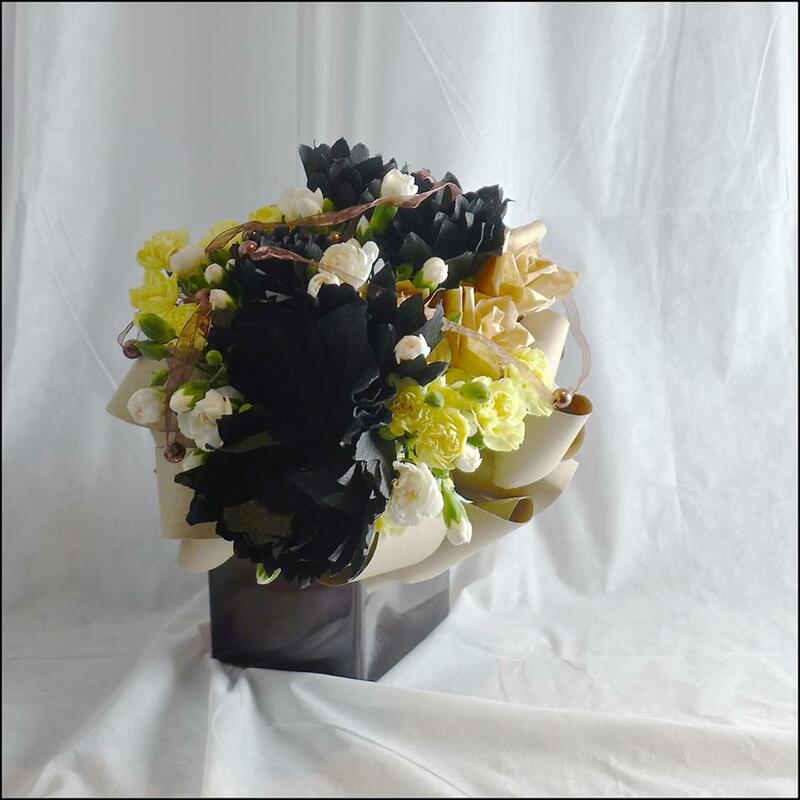 Since there are so few flowers and it’s mainly made of other materials. One wants to be original and creative, right? But sometimes you just get a creative block and can’t come up with any new ideas. 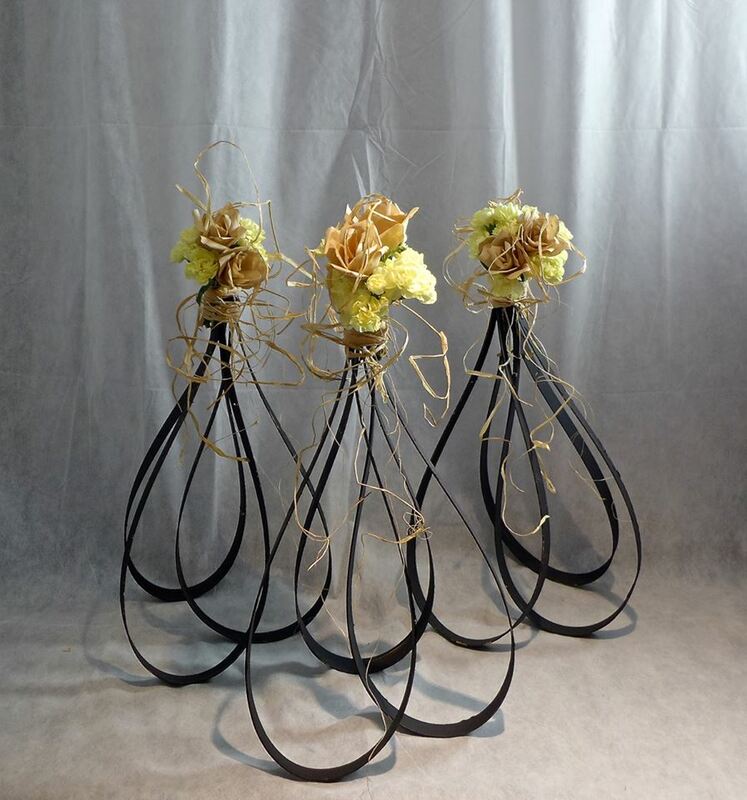 So why don’t you just make something simple and traditional instead, a basic round bouquet? Mix any materials you can find with fresh plant material, and it’s guaranteed your bouquet will end up looking unique without any effort. 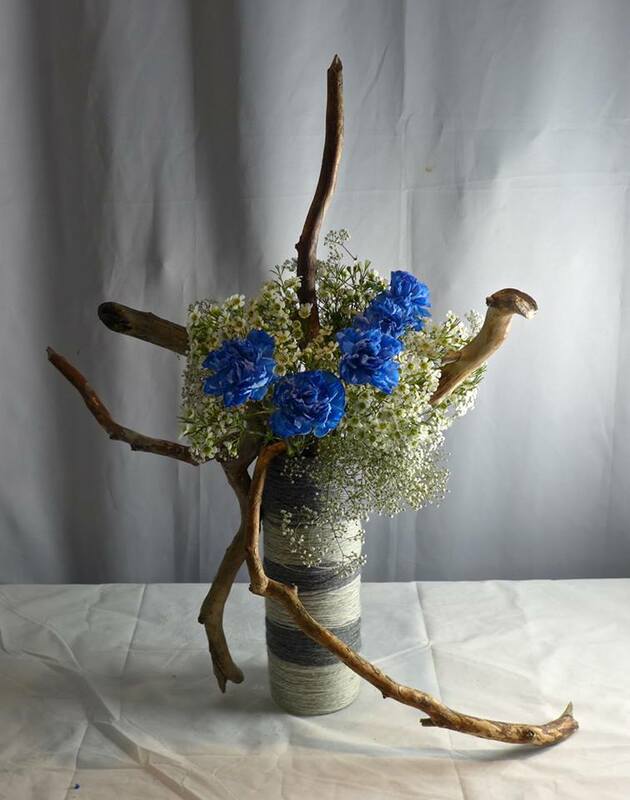 Being a Nordic hobby florist I’d like to do flower arrangements also in winter time even though I find fresh flowers priced way beyond my budget. What do you do then? Mix other materials with flowers to keep the costs down. Some might say it looks cheap, but I don’t care. For me, cheap is chic. 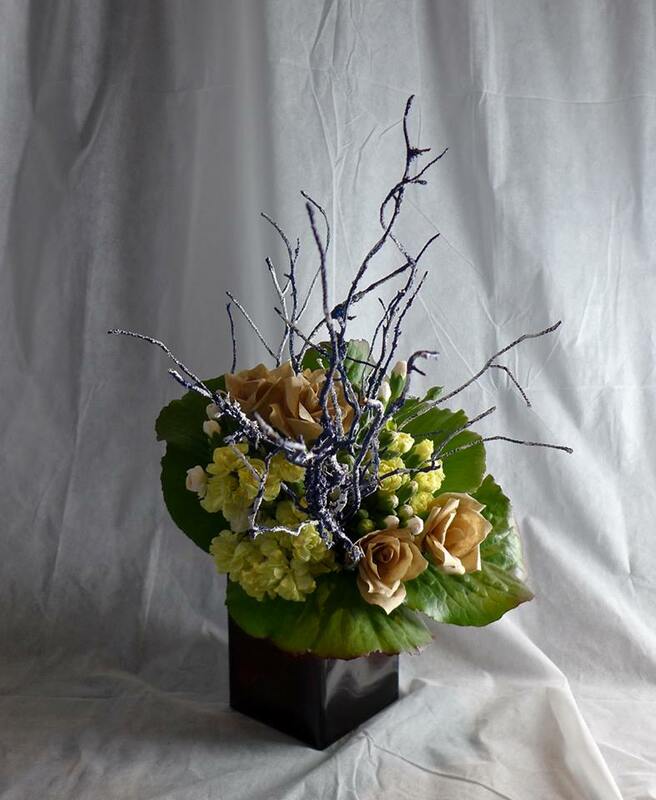 In that bouquet above I used bergenia leaves from my mum’s garden, with painted twigs and carnations. And paper roses, those lovely paper roses which I got from my neighbor. She made the roses from coffee filters and I find them so elegant. You can’t find real brown roses anyway, or if you do, they are artificially dyed anyway. And the dark brown vase is second-hand glassware from a thrift store. I mean, who would use new glassware, when there are so many second-hand items available which cost practically nothing. Well, I guess someone has to use brand new stuff, otherwise there wouldn’t be any second-hand shops. Sometimes more is more. My neighbor made also some black dahlia-like paper flowers for me. I combined them with brown paper flowers and fresh carnations. For finishing touch I used some packaging paper and ribbon from a door curtain I found from a flea market. Those dramatic black curves are made from pieces of Venetian window blind. The window blind was made of some sort of wood imitation, so I painted the pieces black. And again I used brown paper roses and fresh carnations. I tend to do several variations from same materials because new ideas come when you’re making arrangements and then you want to try them too. The carnations aren’t in water, but many flowers last few hours without water, so you could do something like this for a special occasion. I’ve changed my language policy and decided to only write in English from now on. My native language is Finnish but I think the majority of my potential readers would be non-Finnish speaking. I’m just too lazy to write every post both in Finnish and English, so the original idea was to write every other post in Finnish. But that’s just confusing, isn’t it? When you are trying to please everyone you just end up pleasing no-one.